Gentrification is the unfortunate flipside of our city’s focus on hip eateries. Don’t get priced out. It’s a big year for Richmond’s food scene: earlier this month, Yelp rated Richmond one of their 2019 Top 10 US Destinations For Food Lovers. The reference to “Richmond’s growing culinary scene” may be great for local restaurant culture, but it’s likely to be terrible for Richmond residents who are eating on a budget. According to the United States census, Richmond grew 9 percent in size between 2000 and 2010. And many of the new people the city is gaining every year are people of means, who move South to escape increasing costs of living in Northern Virginia. It’s no surprise, therefore, that gentrification is in full swing. The average cost to rent an apartment is on the rise in the city’s most popular neighborhoods; according to 2017’s Census ACS survey, average rent for an apartment in Richmond with an average size of 833 sq. ft. has hit $1060, up 5 percent from 2016’s average of $1013. In a 2018 article for the Richmond Times-Dispatch, Ned Oliver noted that desirable neighborhoods in Richmond’s West End (the region that includes Carytown, the Museum District, and Scott’s Addition) have seen an increase in rent costs of over 30 percent since 2012. There’s been plenty of discussion over the past several years about Richmond’s problem with food deserts. However, less discussed are what’s known as “food mirages”: neighborhoods in which low-income residents are suddenly surrounded by upscale restaurants and grocery stores, but still can’t afford to buy food in their area. Richmond’s food mirages might be a great place to go get some delicious sriracha waffles, avocado toast, or fish tacos, but the cost for such dishes can really add up: at Richmond’s trendy new restaurants, costs for a single meal tend to land upwards of $20, and for a relatively small amount of food when all is said and done. For all the foodies out there who worry they’ll be priced out of the city they love, there is a solution: eating at home. “We found on average, it is almost five times more expensive to order delivery from a restaurant than it is to cook at home,” reads a recent Forbes Magazine story, in which they determined the average person spends more than $20 each time they eat at a restaurant. Meanwhile, they found that the average cost to eat at home is only $4. 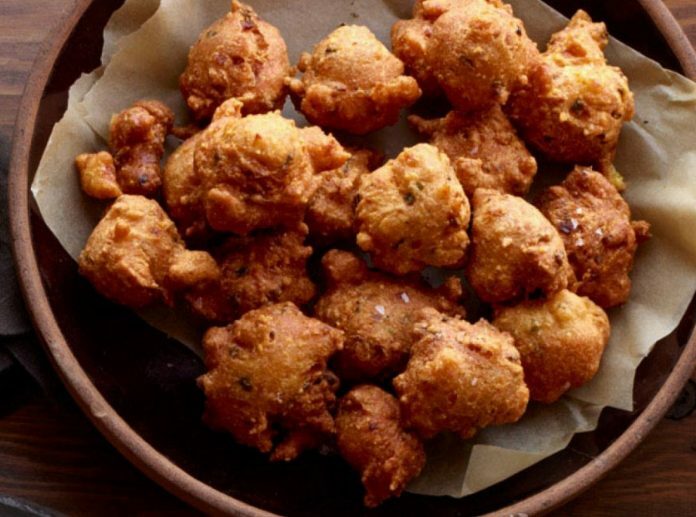 So, instead of going out and spending $45 on a couple beers and a plate of jalapeño hushpuppies, make them at home for significantly cheaper and better the community while doing it. Written by Emily Holter and Marilyn Drew Necci; recipe by Emily Holter. Top photo by Jay Wennington, via Unsplash.